Roll the dough into a disk 3 mm thick and coated with a mold can be opened in a circle of 20 cm in diameter and 3.5 cm high, slightly imburrato.Mettere in the refrigerator for at least 20 minutes. 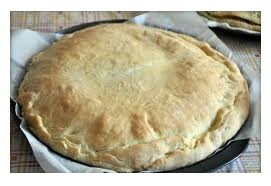 Heat oven to 190 ° C - 380 F. Prick the bottom of pastry shell and continue cooking in the white (or coat the bottom of the pastry with baking paper and above it, fill with dried beans. They just make that the shell of pastacooking does not get up during cooking.) for 20 minutes. Remove pastry shell fromthe beans and greaseproof paper and bake for another 5 minutes. Then removefrom oven. Raise the oven temperature to 200 ° C - 400 F.
Cut mushrooms in half or quarters, depending on size. Melt the butter in a skillet andsauté the mushrooms for 4 to 5 minutes, until they released their liquid. Drain,immerse in cold water and drain well, then pour into a bowl and add the mushrooms. Heat half the cream in a saucepan. Just takes a boil, add the mint, remove fromheat, cover and let infuse until it is almost cold. Pass the cream in a blender for one minute and strain into a pouring bowl. Gentlywith a whisk to incorporate the rest of the cream, egg and egg yolks. Season with salt and pepper. Put the mushrooms and peas in pastry shell and pour the cream-based. Bake for 15 minutes, then lower the temperature to 180 ° C and bake for another 15 minutes.Check the kitchen putting the tip of a knife into the cake should come out clean.Allow to cool before transforming from the mold. Serve the cake is still warm, sliced​​. Your website it's Fantastic! Yours recipes very, very good! My congratulations, Nuxia!